Vehicle access from State Highway 1 (Poutu Bridge) to the Blue Pool. I was asked during the weekend what was happening to access upstream of the Poutu pool. Anglers have seen the steel posts in preparation for a forestry gate to be installed. The photo below is the base for the gate as it was today 18.9.2017. Today I asked DOC Fishery Manager, Dave Conley for an explanation. The first point to make is that there is no easement for public access in place along the footprint of the Blue Pool Access track, and never has been, so to date access for anglers or other users has been at the generosity of the landowners and managers. 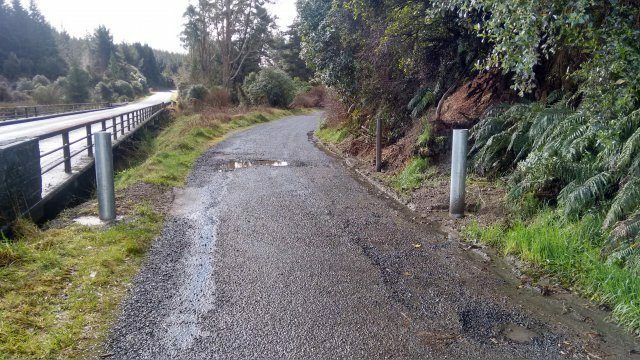 For clarity, it isn’t a legal road at all, rather an access track which was until recently maintained by the Department of Corrections so that anglers, wider public and the rafting companies could access the upper Tongariro. With the closure of the prison, the land was offered to Iwi for purchase and subsequently the Blue Pool access way is now on private land. There was no easement for public access put in place during the sale process, which means any future public access will be subject to the agreement of the land owners. Previously the Department of Corrections maintained the access, and more latterly the current landowners has continued to allow public access. The upcoming closure period is intended to allow for forest harvesting to take place. NZ Forest Managers, who are contracted to manage access and forestry activity on behalf of the landowners, have advised the access will be gated in the next week or two, so that the forest blocks alongside the road can be harvested. It’s important to manage access while the harvesting takes place, due to the HSE hazard this represents. We are advised that the harvesting will take up to 6 weeks, during which time the road will be closed to the public. Rafting companies will be allowed to come and go on a schedule, but all other access, including by foot will be prohibited. With regards to access for anglers, they can continue to access the river upstream of Red Hut on the true right bank, and in normal flows there is reasonable foot access as far as the Boulder Pool. Long term angler access is secured under the Maori Land Amendment and Maori Land Claims Adjustment Act 1926 along both banks up to the current Fence Pool. It is my hope after the forest blocks are harvested, access for the general public along the blue pool vehicle track will be restored, but in the event it isn’t the Fishery will work to ensure there is foot access for anglers on the true left bank from the Poutu Pool upstream to the Fence Pool by way of a new track network. The matter will be discussed at the next Taupo Fishing Advisory Committee (TFAC). I appreciated the prompt and informative response from Dave. Winter has seemed longer than other years. It was certainly a winter feel today with fresh snow on Pihanga and the surrounding ranges but the willow is sprouting leaves and spring flowers are blooming which give a lie to a longer winter than usual. But there has been a lot of rain. The fishing has been great. This afternoon I fished with Richard Kemp. In less than 2 hours we landed 6 fish between us. All were in excess of 1.6 kg, fresh run and in excellent condition. It has been a great fishing season. There are plenty of excellent fish in the river. It is pleasing to see more water flowing through the natural course of the river from the Bain Pool to the Reed Pool and the flood channel being the lesser flow. I fished last Saturday the Big Bend Pool with Warren Butterworth. In short time we both took a couple of good fish. Warren with a nymph and me with a wet fly. Tongariro River Motel, Sporting Life, Rafting New Zealand and Turangi Tavern and Fishing and Outdoors have updated the map previously produced by the Advocates at a time when Ross was a committee member of the Advocates. Ross has given us maps for our members which will be posted with our 2018 subscriptions notice. We appreciate the gesture and thank Ross for his generosity. I have referred to the passing of one or two members that I knew well but have been uncomfortable recording the passing as a policy. But if a member wishes to record an obituary then I will publish it in this blog. Mark Cosgrove, our foundation President asks that we record these three past members. Mark wrote the obituaries. Bob APPLETON, founding member and on the first committee. had for many years campaigned for the preservation of the Maowhango river if only in its channel state. As well, selflessly Bob adapted the Night Owls vigilance of river car parks during a period of vehicle damage. Bob was prepared to spend many hours at those hot spots in order to deter vandals. John WHEELER, joined the Advocates principally to guide the development of the Tongariro Trail. He brought his profession as a surveyor together with love of the outdoors (long a member of the mountain clubs of New Zealand) and other adventurous pastimes, alongside the Advocates dream of a three day walk/cycle trail. Socially, he set up mystery breakfast picnics for local advocate members in several scenic places before settling on the Pukawa foreshore. We appreciate the contributions these people made to our society and extend our condolences to their families.